They say everything is bigger and better in the Lone Star state. Maybe it’s time to mosey on down and see for yourself. The Youth Orchestra Division of the League has put together a conference schedule that rivals a Texas barbeque in size and scope. Since we all know the early bird gets the worm, it might be a good idea to tack up and ride on in to one of the leadership seminars offered prior to the opening of the conference. Sessions on expanding diversity and inclusion at orchestras, conflict navigation, fundraising effectiveness for boards, and communication tools during stressed environments are sure to set your leadership grill a sizzlin’ even before the main event begins. Once you’re here you can relax with a sarsaparilla and whoop and holler for the Oklahoma Youth Orchestra who will be offering a presentation at the opening session. Afterwards, lasso in a few toolbox sessions including ones about strategic approach to changing the system, diversity and inclusion, El Sistema and public value essentials. And just to make sure your saddlebags are full we’ve got additional sessions regarding deepening community engagement and inventing the future. Of course, you also don’t want to miss the square dance! A performance by the Dallas Symphony’s Young Strings Program celebrating its 20th anniversary as well as a Call to Action by Clive Gillinson of Carnegie Hall will get your boots tappin’ for sure. But don’t take my word for it. Check out the entire rodeo here. So shine your spurs, get out your ten-gallon hat and saunter on down to Dallas in June! Don’t forget our general sessions too, which will include “A Call To Action” by Clive Gillinson of Carnegie Hall. The Anchorage Youth Symphony will embark on a 14 day tour of Europe in May & June 2012. Performance venues will include the Mozarteum in Salzburg, the Military History Museum in Budapest, Reduta Hall and Festaal Universitat Wien in Vienna. Nearly 65 musicians from Alaska will participate, conducted by Music Director Linn Weeda. Bay Youth Orchestras of Virginia celebrates its 40th Anniversary this year. To mark the year, we have commissioned a piece by James Hosay, a local composer, to write a “Symphony for Youth Orchestra, Rivers of the Chesapeake”. Each movement is written for a different ensemble in our youth orchestra program and will be premiered on Friday, May 11 at Norfolk State University L. Douglas Wilder Performing Arts Center. James Hosay is an alumnus of the youth orchestra and titled each movement for a river of the Chesapeake. His music is melodic, rhythmic and programmatic which the students enjoy. Over 250 student musicians from all over the Virginia Hampton Roads area create four performing ensembles to present concerts throughout the Tidewater area. Students from as far away as Williamsburg, Yorktown, and North Carolina, and as close as Virginia Beach, Chesapeake, Hampton, and Norfolk attend weekly rehearsals in Norfolk, Virginia. The California Youth Symphony, based in Palo Alto CA, is celebrating its 60th anniversary and is hosting a 60th Alumni Reunion Concert and Dinner on Saturday, May 19th at Spangenberg Theatre in Palo Alto. The California Youth Symphony Reunion event will bring alumni together for making music at an afternoon Reunion Concert featuring Dvorak's New World Symphony and Wagner's Die Meistersinger Overture, and then reminisce about their 'CYS' days during a banquet dinner at the Fremont Hills Country Club. Tickets are $50/adult; $35/student and available online here. All CYS alumni are invited to join us to celebrate 60 years of musical excellence. On April 9, 100 alumni from throughout Chicago Youth Symphony Orchestras’ 65 year history joined current students in performing Strauss’ Alpine Symphony during a special alumni concert. During the concert, CYSO also accepted the 2012 Illinois Council of Orchestras Programming of the Year award in recognition of its innovative musical choices. 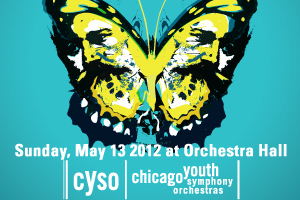 CYSO’s 65th Anniversary celebration continues with a Mother’s Day concert featuring Tchaikovsky's Symphony No. 5 and two world premieres: Concerto Duo for Flute, Clarinet and Orchestra by CYSO's 2010-2012 Composer-In-Residence Joel Puckett and Blow It Up, Start Again by Jonathan Newman. The concerto will feature CYSO alumni Demarre McGill, principal flute of the Seattle Symphony, and Anthony McGill, principal clarinet of the Metropolitan Opera Orchestra. Then, on June 3, CYSO’s Symphony Orchestra will perform in Chicago’s Millennium Park before touring to Madrid, Cuenca (for a joint concert with the Joven Orquesta de la Mancha), Valencia and Barcelona June 14-24. The Cleveland Orchestra Youth Orchestra will make its first international tour in June 2012, a European Tour that includes concerts in Prague, Vienna, and Salzburg. The tour takes place from June 13-21, 2012. The Youth Orchestra’s concerts will be performed in the Dvo?ák Hall of the Rudolfinum in Prague (June 15); the Minoritenkirche, a historic, Gothic church in the heart of Vienna (June 18); and the Grosser Saal of the Mozarteum in Salzburg (June 20). The Youth Orchestra will be conducted by Music Director James Feddeck, who is also assistant conductor of The Cleveland Orchestra. With the Youth Orchestra, he has presented concerts in Severance Hall and throughout Northeast Ohio. The Cleveland Orchestra Youth Orchestra will be performing a tour send-off concert in Cleveland on Saturday, June 9, 2012, at 8:00 p.m. at Severance Hall. The performance will be broadcast live on WCLV (104.9 FM). Empire State Youth Orchestras, Capital Region, NY, added a component to its City Instruments program through which low-income, inner-city youth in Albany and Schenectady, NY, are given free music lessons. The sixteen-year old program originally focused on stringed instruments; now brass players can also participate. 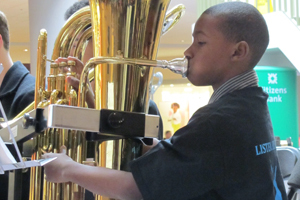 City Instruments gives disadvantaged youth a chance to improve musical skills and get on an even playing field with their more privileged counterparts. Students learn much more than music; they gain positive character attributes: discipline, dedication, responsibility, and increased self-esteem. One young trumpet player who is autistic found that the music lessons have really helped him to focus. An 8th-grade violinist reported that her math grade increased from a “D” to an “A” and believed that to be a direct result of participating in the program. City Instruments generates no income; it is funded by donations from individuals and foundations. Learn more here. The Etowah Youth Symphony Orchestra will premiere James Woodward's Concerto for Violin, Cello, and Orchestra on Sunday, May 20th, featuring the Coppey Duo from Switzerland as soloists. The piece will receive an additional performance on May 26th featuring the same soloists. Woodward is in his second season as Composer-In-Residence of the EYO. In addition, the EYO has announced premieres by Woodward and Alexander Borenstein for the 2012-2013 season, and a 2014 performance tour with stops in Seattle, Chicago, and Glacier National Park, via the Amtrak Empire Builder. March was a very busy month for the Greater Miami Youth Symphony (www.gmys.org) which was involved in two collaborations. On Saturday, March 17, the concerto “Hypnagogia" for Violin and Orchestra by Thomas Sleeper was world premiered at the University of Miami's Gusman Concert Hall in Coral Gables, Florida. This work was specially commissioned for the Symphony Orchestra and its music director, violinist Huifang Chen. Andrés Jaime served as guest conductor. “Hypnagogia” is a powerful three-movement work referring to the transitional state between wakefulness and sleep. It is a multimedia presentation with the visual component including projections of images by artist Sherri Tan, which were displayed above the orchestra during the performance. On Sunday, March 18, GMYS collaborated with the South Florida Youth Symphony in a side-by-side concert at the Jules Littman Performing Arts Center in North Miami Beach, Florida. Three out of the seven GMYS performing ensembles participated: String Orchestra, Concert Orchestra and Symphony Orchestra. GPYO finishes up its 2011-12 season with an exciting month of concerts in June. They begin with our end of season concert on June 9 at Richardson Audition, Princeton University, featuring our talented and versatile concertmaster, Julian Edgren performing as soloist a movement of Rachmaninoff's Piano Concerto #2. Then GPYO has a performance at Lincoln Center, NYC, on June 17, and finally a concert on June 30 at the Princeton Performing Arts Center to celebrate Princeton's 20th anniversary celebration of its sister city relationship with Pettoranello, Italy. We, the National Youth Orchestra of Iraq, are building up to our UK visit after our huge success in Beethovenfest, Bonn. Check out www.nyoiraq.com for our latest news on Facebook, Twitter and YouTube. Supported by Scottish Government, British Council and Edinburgh YO we're visiting Edinburgh Festival Fringe, Glasgow & London with Julian Lloyd Webber, oud player Khyam Allami & new music by Karzan Mamood and Osama Abdul Rasool. This year builds on sustainable training for the young musicians to deliver good teaching practice and ensemble music making back in Iraq. In early December, Northern Ohio Youth Orchestra's (NOYO's) Philharmonia orchestra took a weekend trip to Kitchener, Canada where we played with the Kitchener-Waterloo Youth Symphony Orchestra. This was the second half of an orchestra exchange after their orchestra visited us in late October. We culminated the trip with a stop in Niagara Falls and lunch at the Hard Rock Cafe. It was a wonderful experience for everyone. Oakland Youth Orchestra will start their 49th season with a new conductor, Maestro John Kendall Bailey, who is also a musicologist and educator. The season will close with a commission by Jack Perla. OYO will tour to Argentina in early summer 2013. On Saturday, March 31, 2012, members of the award-winning Philadelphia Sinfonia sat side-by-side with The Philadelphia Orchestra in a rehearsal on Brahms's Symphony No. 2, under the baton of Orchestra Assistant Conductor Cristian Macelaru. The event was a once in a lifetime opportunity for the young musicians of Sinfonia; an experience they will remember well into their future careers. This is the second time Sinfonia has been invited to participate in a side-by-side with the Fabulous Philadelphians. Sinfonia will perform Brahms's Symphony No. 2 on May 15 at the final concert of their season at The Kimmel Center for the Performing Arts. The Pittsburgh Youth Symphony Orchestra will perform on a regular subscription concert of the Pittsburgh Symphony, as part of their Paris Festival - City of Lights - April 27 to May 13, presenting three performances of Milhaud's La Creation du Monde with dancers from the Attack Theatre. TRYPO is excited to announce a new affiliation with City Music Center (CMC) at the Mary Pappert School of Music of Duquesne University. With the collaboration between CMC and TRYPO, any student wishing for a well-rounded music education experience in the city of Pittsburgh, PA– whether preparing to major in music in college, or just for the experience of learning and performing with like-minded students – need look no further than City Music Center. TRYPO will be included as a curriculum component for CMC and membership in TRYPO will be included in standard CMC tuition, following acceptance into one of its orchestras by audition. Students wishing to participate in only TRYPO or only CMC will still be able to have a la carte membership in either program, but will have more options and their parents will be able to see their tuition funds providing more opportunities for their children. 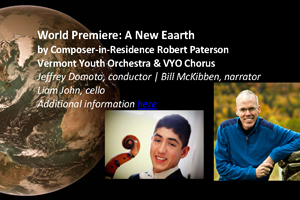 VYO & VYO Chorus Present World Premiere of A New Eaarth: The Vermont Youth Orchestra, led by Music Director Jeffrey Domoto, presents the World Premiere of A New Eaarth written by Music Alive Composer-in-Residence Robert Paterson on Sunday, May 6 at the Flynn Center for the Performing Arts in Burlington. The orchestra will be joined by the VYO Chorus and environmentalist/author Bill McKibben, who will serve as narrator. This monumental performance marks the culmination of Mr. Paterson’s three-year residency with the VYOA. The residency was funded by the League of American Orchestras and New Music USA. The concert program’s overarching environmental theme is especially poignant as many in Vermont continue to struggle in the wake of damage sustained by Hurricane Irene. The instrumentalists and singers of the VYOA are thrilled to present this unique, new piece for the first time. Additional Information at vyo.org. Wisconsin Youth Symphony Orchestras will embark an on international tour this summer when its premier performing group, the Youth Orchestra, travels to Prague, Vienna, and Budapest in July. The young musicians will have the opportunity to visit some of the most important locations in classical music history, including a guided tour of the Esterhazy Palace in Eisenstadt, Austria, home of Joseph Haydn. The Youth Orchestra members, led by conductor Jim Smith, will also perform in Glasenersaal of the Musikverein in Vienna and the Czech Museum of Music in Prague. Repertoire for the tour will include Vaughan Williams’s London Symphony, Le Roi d’Ys Overture by Lalo, Slavonic Dance No. 8 by Dvorak, and The Courtly Dances from Gloriana by Britten. It’s been another gangbuster year for the Youth Orchestras of Fresno, with two concerts in December—including a staging of Hansel and Gretel—and a sold-out Valentine’s Day concert with tenor Scott Piper and mezzo Layna Chianakas. (Piper, known for his powerful voice, was characterized by our local arts reporter as “a human sub-woofer.”) We also initiated our Accent on Access free daily afterschool violin program at a downtown elementary school. This spring the Youth Orchestras will host the first-ever Fresno International Youth Orchestra (FiYO) Festival, May 22-27, 2012. Young musicians from around the world and around the country will join our players in a performance of the Marquez Danzon No. 2 and the Shostakovich Eleventh Symphony, conducted by Music Director Thomas Loewenheim. You’re all invited! Check it out here. And there’s more: eleven Painted Violins will be auctioned off at the gala May 27 FiYO Festival Concert. The Youth Symphony of Kansas City's most advanced orchestra, Symphony Orchestra, performs in a free concert on Sunday, April 22 at the new Kauffman Center for the Performing Arts. Conducted by Steven D. Davis, the orchestra will perform Bruckner: Symphony No. 4 "Romantic" and Wagner: Tannhauser Overture. This is the second of three performances by the ensemble at the iconic new performance hall. The third and final performance this season will take place on Tuesday, June 5 in a Side-by-Side format with the Kansas City Symphony. This performance features Wagner's Tannhauser Overture and Tchaikovsky’s Symphony No. 4. More information about the Youth Symphony of Kansas City can be found online here. This year saw a 100% increase in auditions and marked improvement in quality on the back of Beethovenfest, last year. The reconciliation process is slowly taking root, as the intensity of our music making breaks down barriers of race, language, sectarianism and gender. As before, the musicians' intrinsic motivation and learning hunger outstrips anything I've seen in the West. Still a long way to go, but we're not trying to be a great orchestra, just gluing society back together with collective music making. My challenge remains training people with almost no orchestral or ensemble experience or teachers in a few weeks, to produce a concert with international media breathing down our necks. We really have to live our core values of love, commitment and respect, along with patience, to get the result. It's about sensitising the soul, freeing them up to react and listen to each other and me. Junior Youth Orchestra Capriccio Italien by Tchaikovsky, arr. Isaac Die Meistersinger (excerpts from the opera) by Richard Wagner, arr. Siennecki Thunder & Lightening Polka (with Orchestra in the Schools) by Strauss, arr. Isaac Honors Orchestra Symphony No. 39 byWolfgang Amadeus Mozart First movement- Adagio Second movement –Andante con moto Third movement -Menuetto Fourth movement –Finale. The National Endowment for the Arts released a research report indicating several positive outcomes associated with high levels of arts exposure for youth of low socioeconomic status. According to a study led by James S. Catterall of four separate longitudinal studies, at-risk students who have access to the arts in or out of school appear to have better academic results, better workforce opportunities, and more civic engagement than at-risk students who do not. Following the May 2011 “First Look” preview, the long-awaited federal snapshot of Arts Education, "Arts Education in Public Elementary and Secondary Schools: 1999-2000 and 2009-10" (also known as the Fast Response Survey System) was released in full on April 2, 2012. This survey, conducted by the National Center on Education Statistics (NCES), in partnership with the Office of Innovation and Improvement at the U.S. Department of Education, is the first collection of information in 10 years. Principals and teachers (including arts specialists as well as elementary classroom teachers) reported during the 2009-2010 school year on the conditions of K-12 arts education. The League, together with its national partners, is working to create a toolkit to help orchestras understand and communicate about the Snapshot FRSS results and will make these tools available online soon. The Arts Education Partnership has newly launched ArtsEdSearch.org, a digital clearinghouse of research and policy information about the educational outcomes of arts learning, both in and out of school. ArtsEdSearch.org contains 200 summaries of high quality research studies that include all arts forms and all levels of education.